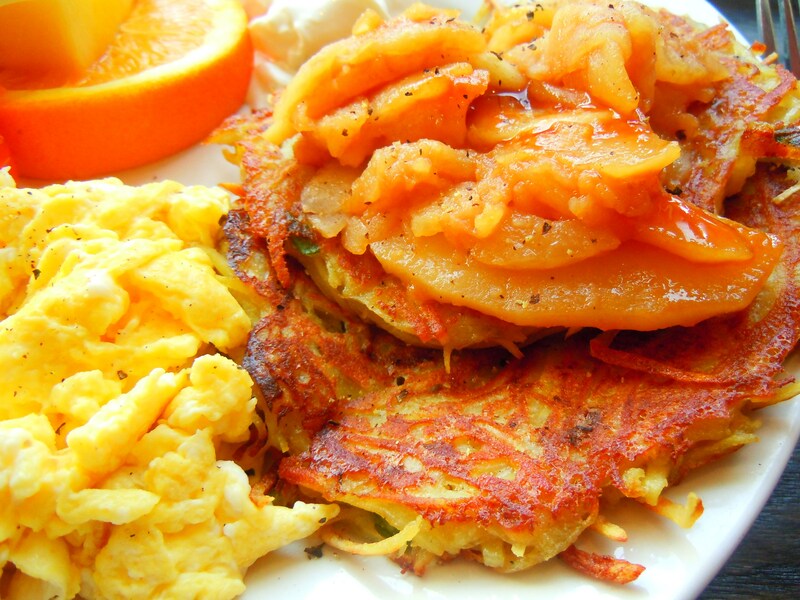 Potato Pancakes & Sweet Apples – Weekend Brunch at ViVetha Bistro in Yonge Lawrence Village! Happy St. Patty’s Day, everyone! Okay, so today’s weekend brunch post isn’t an Irish one but it does involve potatoes so that’s something! I’ve missed blogging about weekend brunch so much. Aside from cupcakes and sushi, it’s my favourite thing to write about on Ate by Ate and it’s the one series on the blog I’m most passionate to see grow. I started a fun “Get Cracking – Egg Breakfasts!” photo gallery on Ate by Ate’s Facebook page that I can’t wait to add more to (can you tell I love eggs in all its forms?!) and I’m so happy that I’ve been able to rack up over 20 posts on weekend brunch meals in the city thus far! And that’s not even counting the non-weekend breakfast posts I’ve done. I’m especially excited about this particular post though because I’ve been trying to integrate more pancake related material into the series and this totally fits the bill in a non-traditional way – we’re talking pancakes potato-style! My family and I love potato pancakes. 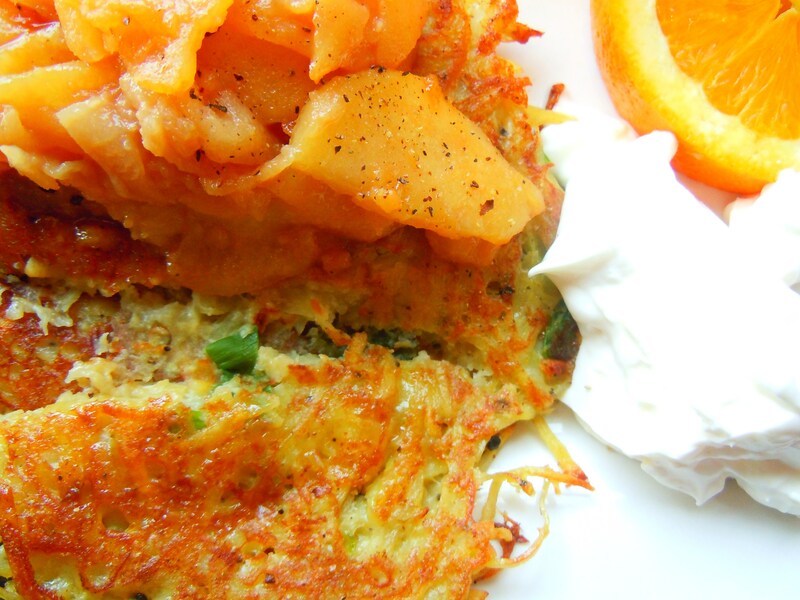 I’m obsessed with crispy potato rosti with sour cream, my brother and I love wafer thin, crispy hash browns, my brother has had the potato pancakes from Futures Bakery, and one of my all-time, favourite home-cooked dishes made by my mom is her potato patties with green onions and diced barbecued pork. She mashes freshly boiled potatoes, mixes the green onions and pork in, shapes them into cute little patties, and throws them into the skillet to get them gorgeously golden brown. It is such a treat and it’s been a favourite of mine since I was little. She doesn’t make them often just because they’re a little more time-consuming and labour intensive, but when she does, everyone in the house is over the moon! One of these days I’ll give it a go and we’ll see if they measure up! 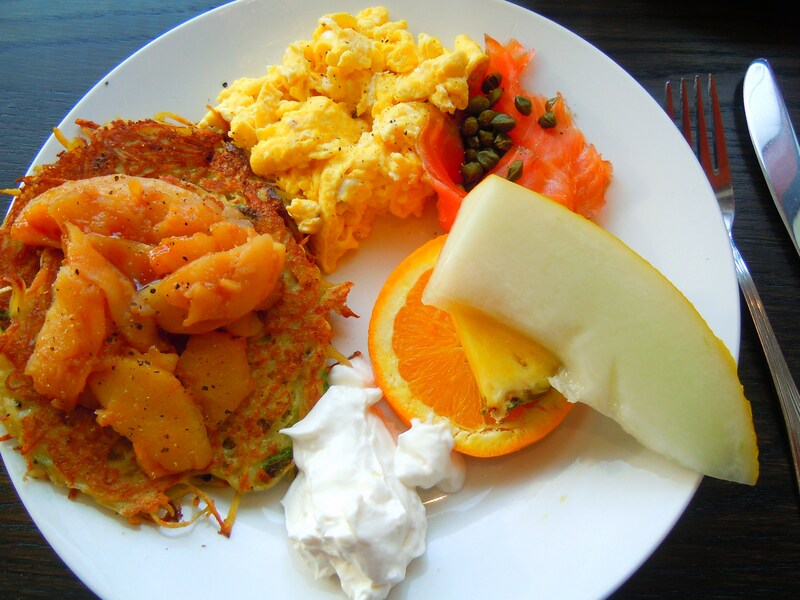 This post features a potato pancake weekend brunch meal from uptown bistro, ViVetha Bistro in the Yonge & Lawrence neighbourhood! This spot is AMAZING! I cannot wait to come back for another round. 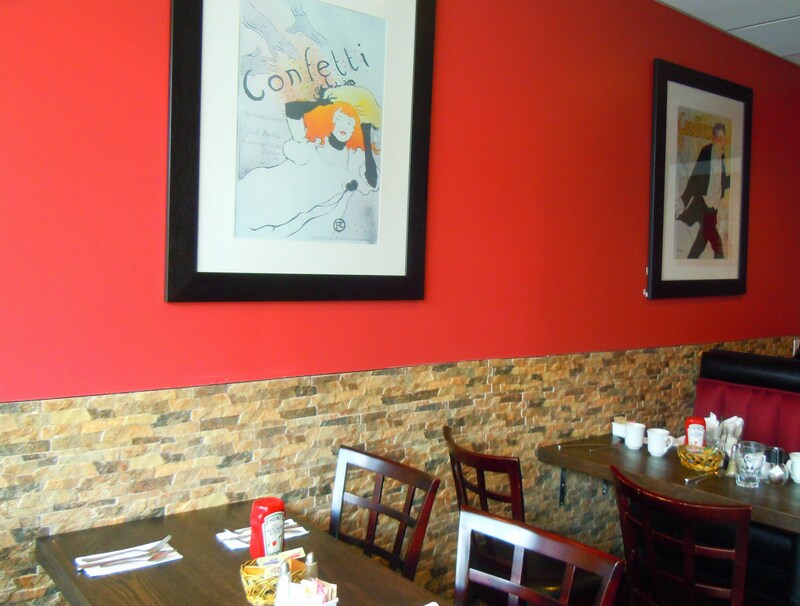 Their food is delicious, their menu is varied and big, and their space is sweet, sunny, and cozy. And how did I discover such a fabulous spot? By walking around. Again. 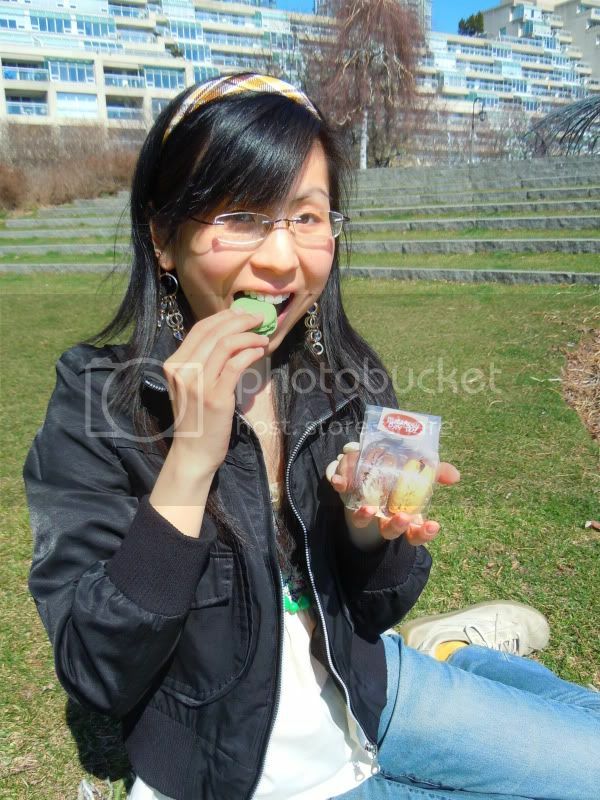 I make my best food discoveries just strolling around on a relaxing day of exploration. I was in the Yonge & Lawrence neighbourhood months ago and while I was walking, I see their menu taped to the inside of their front window and knew off the bat I had to come back for some delicious eats. 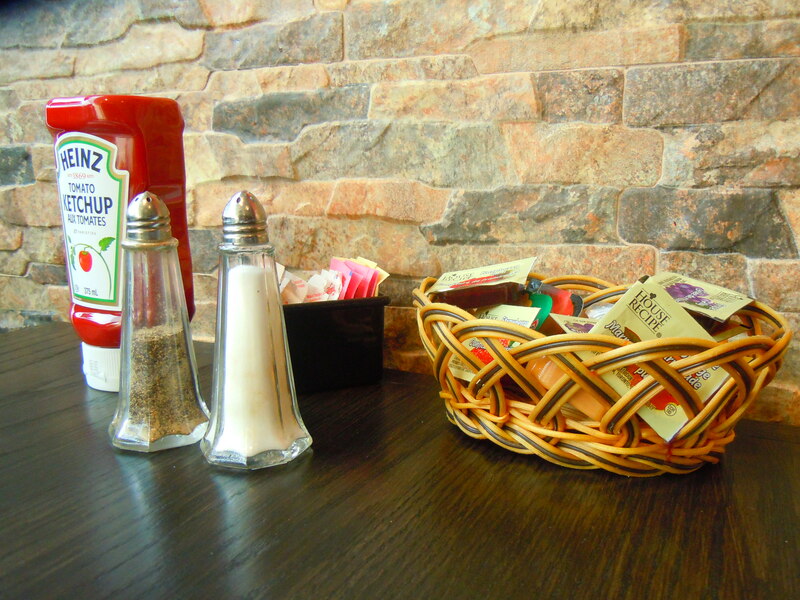 ViVetha weekend brunch menu offers a little bit of everything – plenty of different egg breakfasts (lots of omelettes and eggs benedict), pancakes and French toast, and salads, sandwiches, and pasta. Yes, pasta! It wasn’t until I started going to Italian and European-style brunch spots that I became used to seeing pasta on the brunch menu. You’re talking to a girl who grew up eating congee for breakfast when she was a tiny tot, then Fruit Loops cereal, and eggs and ham as a kid and then dim sum woven in every so often. I was always used to having noodles for breakfast as well, but pasta is a little different. It’s like how I had my spinach pappardelle bolognese pasta dish at Terroni Centrale last November . It was the first time I ordered pasta for brunch and I have to say, I LOVED it. You think you’re not hungry enough to eat it but trust me, you are. Anyway, prices are incredibly average and reasonable. I’m accustomed to seeing weekend brunch prices hovering around the $11-$15 range but at ViVetha, you can easily order a meal for under $10. Many meals come in at $8 or $9 with some of the more entree type plates (like pasta and such) averaging $11-$14. 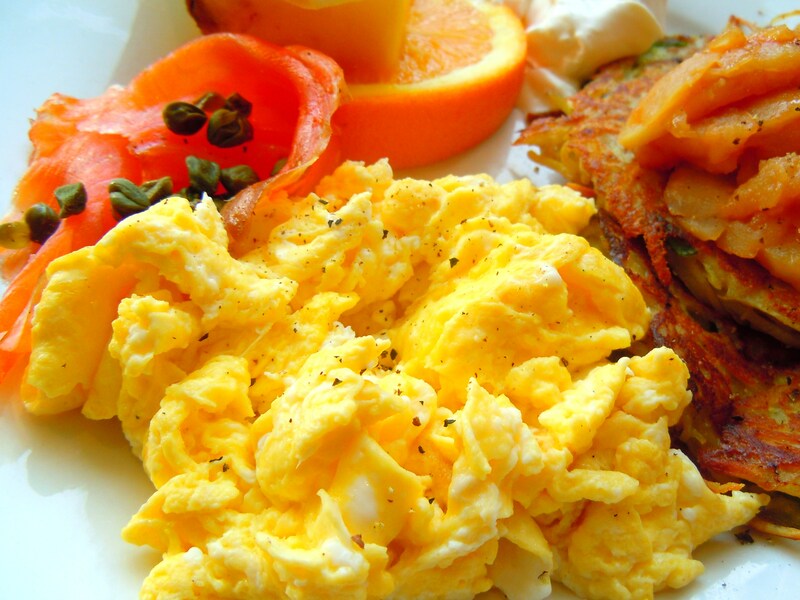 They also offer weekly brunch specials that are separate from their permanent menu. I love that! It keeps things exciting, new and fresh that way, especially if you’re a regular. I had the hardest time choosing between my meal and one of the weekly specials (an eggs benny with beef tenderloin tips, smoked salmon and bocconcini – OH MY GOD). But I went for my potato pancake meal because I really wanted to have something pancake-related, plus there was PLENTY to make my mouth water in this dish! 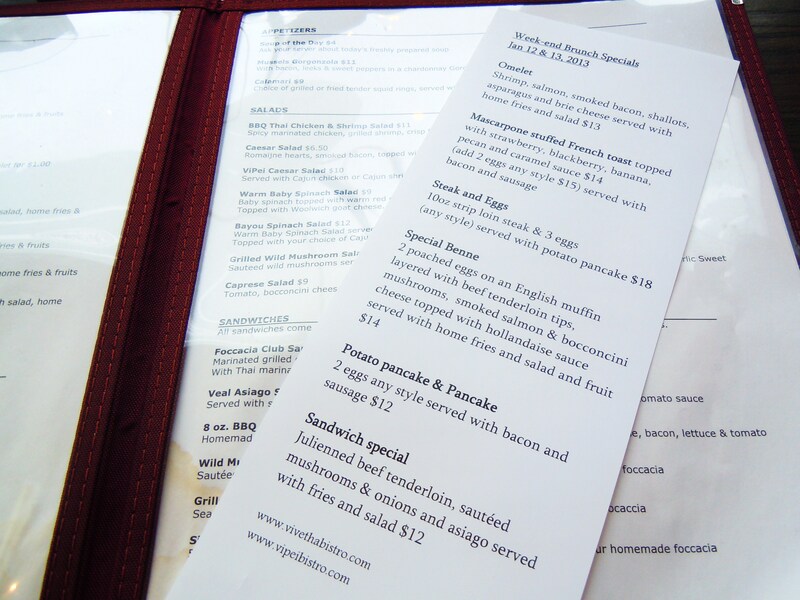 ViVetha actually has two potato pancake menu options, one that is served with bacon and sausage, and the other that’s served with smoked salmon and eggs. You can probably guess which one I chose. That’s right, the one with my beloved smoked salmon and eggs! My potato pancake platter ($11) was comprised of two big potato pancakes (shredded potatoes and green onions fried golden brown), slices of smoked salmon, 2 eggs any style (I had mine fluffy scrambled!) and a generous helping of sweet sauteed apples, sour cream and capers, and some fruit on the side. EVERYTHING I LOVE! Potatoes, sour cream, apples I could eat (recall my raw apple allergy! 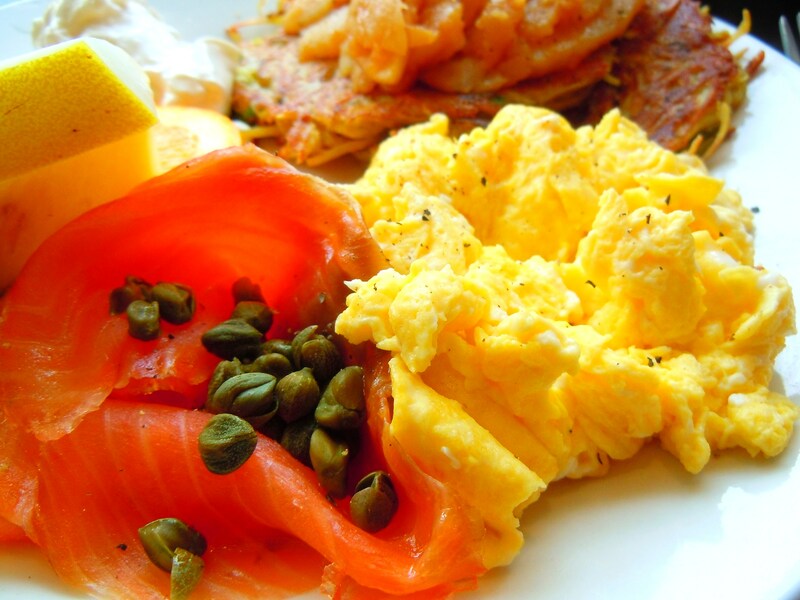 ), smoked salmon, eggs, and some nice salty capers. 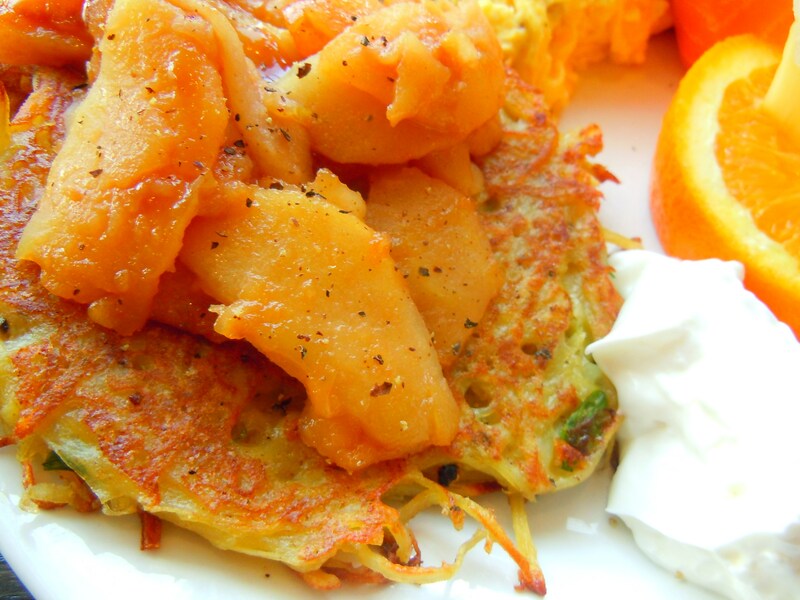 The meal really plays on eastern European flavours (apples/applesauce with potato patties!) and the whole dish was just really balanced as there were equal portions of everything. There were lots of different textures and flavours going on that complemented each other: the crispiness of the potato pancakes which was crucial to preventing the meal from being too “soft”, the sweetness of the apples that cut through the saltiness of the capers and smoked salmon, and the sour cream which gave a nice punch of cool tanginess and creaminess to the whole dish. Truly though, the apples make this dish. Anybody can say that they had potatoes with their breakfast (hash browns, home fries, whatever), but not many can say that their potato brunch came with a sweet order of apples! ViVetha is truly a gem in the neighbourhood and in the city in general. I have French toast, pancakes, pasta, and more eggs benny calling my time for future visits! ViVetha (or ViPei as it is also known as) serves 4 locations in the city. This particular location is located in uptown Toronto at 3334 Yonge Street, right by the corner of St. Germain Ave., in the Yonge & Lawrence neighbourhood on the west side of Yonge Street. Even though it’s somewhat in between York Mills and Lawrence, trust me when I say that it is much easier and faster to get here from Lawrence!